Let the record show that I didn’t want to do this since (a) it looks like a vanity piece even though I resisted and am intensely uncomfortable with the idea of featuring myself; (b) I don’t really have much to say that I don’t say every couple of days; and (c) HIStalk is about news and opinion, not about me. However, Dr. Gregg Alexander was persistent, and since he writes for HIStalk Practice, I felt bad after saying “no” the first handful of times. So, I’m disclaiming all responsibility and turning it over to Gregg. This is my first and last interview. An HIT Moment with … is usually a quick interview with someone “we” find interesting. 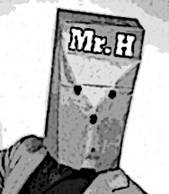 Today, I have been granted the unusual and tremendous honor of turning the tables upon Mr. HIStalk, HIS-self. As you know, Mr. H is founder and chief organizer of HIStalk. You are a humble guy, but even you must admit the breadth of HIT industry folks who read HIStalk on a regular basis is pretty impressive. What’s your take on the not insignificant impact HIStalk continues to have upon this multi-billion dollar industry? It’s hard for me to say. I just sit alone in an empty room and type onto an empty screen. I’ve never heard anyone at my job mention HIStalk. Nobody there knows I do it. I could count on one hand, probably, the number of people I’ve heard say the word HIStalk to me directly. That’s fine since it’s kind of creepy for me to hear people talking about it. It’s a private activity for me. As you know, I didn’t want to do this interview and tried to ignore your request until you asked a second time. I figured I owed you since you write some fine articles for HIStalk Practice, but otherwise, I probably wouldn’t have done it. I’ve turned down quite a few people before. I know a fair number of people read HIStalk and I’m really happy about that, but in terms of impact I really don’t know. The only reaction I get is the occasional e-mail. I’m like the guy who throws the morning paper in your driveway. I don’t really know what you do with it, why you read it, or what affect it has had on you. I just keep doing my job and hope you find it useful enough to keep reading. If so, I’m happy to keep right on doing it. I hope it has been fun for the people who read it. I hope it provides a virtual industry water cooler to chat around since so many of us are far-flung and maybe on the road most of the time. I hope it has educated a few industry newcomers. Most of all, I hope it has provided a dialogue, not just my monologue, on what a cross-section of industry savvy readers think about new developments and concepts that affect healthcare IT and, ultimately, patients. It helps that I work in the industry in a non-profit hospital. Most healthcare IT writers don’t, so they don’t really know what’s important, what’s BS, and how it all fits together. They are good at crafting clever sentences, but they don’t know what they should contain. I’m pretty efficient at bringing all the information I have together and hopefully presenting it in a concise and entertaining way. There’s nothing phony or contrived about the way I write, so it’s just me, no different than what it was six years ago, so I can crank it out pretty fast. Readers help me immensely by e-mailing when they hear something new or have an opinion to share and I value that a lot. I spend hours putting together something that looks like a quick, easy read. The longer I work, the easier it looks. I’ve gotten pretty organized at how and when I write HIStalk, but it’s still a time crunch sometimes. I’m out at least 10 hours a day at work. When I get home, we eat dinner and I head off to the computer. I’m there every evening for at least three hours, sometimes more than five. It takes a lot of time to read and reply to e-mail, to do the primitive recordkeeping I do for sponsorships and all that, and to do the actual writing. I spend a bigger chunk of time on Saturday and Sunday, sometimes more than eight hours each. Luckily, nothing invigorates me more – even after six years and many millions of words written – than sitting down fresh and starting off on another HIStalk. Thank goodness I got Inga to help me awhile back with the writing, the research, and working with our sponsors. I was getting pretty frazzled, especially right around HIMSS time when it all comes to a head. She keeps me sane. We worked together for almost a year before we ever met in person, having decided after a five-minute phone call that we were a good match. She made it fun again. I hope I don’t ignore my family in doing HIStalk. I worry about that. Will I look back someday and wish I’d spent more time doing something more profound? Is it really worthwhile or just a comforting distraction from reality? Or, should I be some kind of astute businessperson and make it bigger or better even though I know next to nothing about starting or running a business and I’m chronically lazy? Until I figure those things out, I’ll just keep doing what I’ve been doing. Speaking of keeping up, there’s so much HIT hubbub these days with ARRA, HITECH, CCHIT, evidenced-based, meaningful use, etc. As you keep a pretty tight finger on the pulse of the goings on in HIT, I’d be curious to hear what your take is on the overall state of the industry. The government wanted IT activity in healthcare and it’s getting it, albeit at a high price. Based on recent activity with the banks and auto industry, I think this administration expects to be an active partner in healthcare, not just a quiet financier of IT systems. IT will give it a way to collect information and develop policies around it. Good or bad, Uncle Sam is the biggest customer of many or most hospitals and doctors and he’s not happy about the value received, so opening the healthcare kimono via IT should be interesting. I would be more excited about using billions of taxpayer dollars if there were at least incentives for vendors to develop new products. It’s mostly the same old systems and same old potential customers, only with federal money forcing their awkward introduction. I hope vendors use some of their new revenue to create new systems based on paradigms and technologies from this millennium instead of just patching up the old ones. I worry that all systems are starting to look and work alike since vendors keep swapping former employees with each other, ensuring cross-pollination instead of innovation. CIOs hate IT risk, though, so maybe everybody will just keep running what they always have except for some of the more exciting niche systems and technology platforms like the iPhone. When it comes to physician practices, I’m not convinced that most of them will take the bait after comparing the potential rewards with the perceived effort required. The government hasn’t been all that reliable and supportive of a partner when it’s tried doctor programs like that before. Doctors know that everybody gets value from EMRs, but they’re the ones on the hook to actually use them. They have nothing to sell but time, so if EMRs are perceived to take more of it, I don’t think the incentives will be enough – except maybe for the small practices that have to count every penny. I would have preferred a rewards system based on sharing patient data, where you get paid extra for making your lab results, prescriptions, and notes available electronically to other providers. Then, let the providers choose whatever tools they want to support that. The final definition of "meaningful use" will most likely include that, so it will probably be fine. All the rewards require a very short time frame for implementation and productive use, which I worry is more than either vendors or providers are ready to tackle. Resources may be an issue. We’re dealing with patient systems, so let’s hope we don’t see unintended consequences from quick and dirty implementations. Some vendors, especially those with marketing machines that can capture the attention of prospects in the small window in which they’ll be buying products, will do very well. Those not so fortunate will have a tough time since HITECH will front-load a lot of sales that would have taken years, so those that don’t succeed in that small time window will find the pickings slim for years afterward. I think a lot of second- and third-tier vendors will scale back, close down, or sell out as a result. There’s a big wave coming, but the trough right behind it could be ugly. We’ll get our critical mass of EMRs, at least assuming everyone gets implemented. The real job is to do something useful with them. That requires focus and change management capabilities, qualities that are hard to come by in many organizations. Without quality reporting, data interchange, and some element of practice standardization, we won’t have gained much by planting all those EMRs. They don’t provide enough efficiency benefit for that alone to be the driver. That could create a new demand for analytics, add-on tools, and formally trained informatics people who can do more than just flip the go-live switch. EMRs might eventually become a commodity as CCHIT, or whatever certifying body is named, expands their functionality checklists to become what could be a full set of specs for an EMR. Maybe you don’t need dozens or hundreds of vendors if they all meet the same basic requirements. Overall then, I would say everybody’s going to be busy for the next five years at least. We’ll probably see mini-Gartner Hype Cycles as new customers buy systems, find them disappointing for one reason or another, but eventually gain benefits they wouldn’t have expected. Way down the road, the power will be in the connection, not the tool used to connect, so EMRs may be as unexciting as buying a PC today — just a generic tool you need do real work by connecting with everybody else on the Internet. Your newest “offspring,” HIStalkPractice…what prompted your address of the physician practice world? Inga came from the physician practice side of the industry, but I was a hospital guy. I knew we weren’t covering everything in HIStalk, but I wasn’t sure that audience was really interested in what was happening with practice management systems, EHRs, CCHIT, and all that kind of detailed discussion. I also knew there were a lot of potentially influential voices that weren’t being heard, such as yours, and I wanted to see if we could cultivate an audience interested in the usual HIStalk style news recap and opinion for that somewhat different market, along with more interviews and guest articles. It has been slow going, but nothing like the years it took to get a few readers of HIStalk. Inga does pretty much all the writing for it other than what our guest authors put together, now that I’ve convinced her she has the knowledge and the ability without me looking over her shoulder. I do nitpick about how she punctuates and structures her sentences sometimes and I know she’s just neurotic enough to let that bother her, so I try to leave her alone. On the “About HIStalk” page, you give a fairly complete background on why you started HIStalk and of your general operating standards. Pretty straightforward about your approach and principles. However, you have a sardonic wit and are often quite blunt about your opinions. Both of these traits make for a great read, but from what you do post from readers, you are often also slammed for your perspective. Do you receive more pointed or insultatory jabs for your writing that don’t make it onto the printed screen? I run most of the e-mails I get on HIStalk if they would interest readers. I do get the occasional viciously nasty and insulting comments, usually for something silly, like years ago when I mentioned some notoriously phony schools where healthcare people were sporting MBAs and PhDs from. I got some threats over that more than once. Those were the only truly angry comments. Sometimes someone complains that I’ve been unfair to a company, have sold out to sponsors, or think I know it all. I do a little self-analysis to see if they have a point that I can learn from, then move on one way or another. I really do try to be fair. I encourage comments that disagree with my opinions. If I rip a company one day, I try to remember to say something nice about them another day. I see my job as being a moderator who introduces a topic, maybe throws out some controversial statements to get the discussions going, and then makes sure everyone plays nice together as they debate. I like it when people get along, but I understand that some of the most valuable stuff comes from heated discussion. I’ve heard a buzz that you and the lovely Inga might be unmasked at the HIStalk reception during HIMSS in Atlanta next year. Just wishful rumor mongering or is there any such possibility? You never know. Inga is a lot more of a schmoozer than me. Sometimes I think she’s about to burst trying to keep the secret that she’s Inga. Unlike me, I think she would probably bask in whatever limelight there is and readers would like her even more than they do now. So, maybe we will arrange her coming out in some fashion at HIMSS. She’s probably already shopping for new shoes. Insightful read. I’m glad you decided to accept the request for an interview. You really do an amazing work and devote an amazing amount of time. The quality of the work is really unmatched on the web. Unmasked or not, you’re work is appreciated. I agree with John Lynn that your writing is of high quality, and your interviews of others are insightful and revealing like Terri Gross on NPR. I’m one of those who is relatively new to the HIT market and Mr. HIStalk was my professor. Thanks for bringing me up to speed sir. One thing I have observed though is that as much as the healthcare sector would like to believe that they are oh so different from other industry sectors when it comes to deploying IT, in reality HC is not all that different and could learn much by stepping outside it’s cloistered environs. I think it would be a full time job to keep up with all of the aspects of HIT…not just part time like HIStalk. You also manage to cover them all deeply…more than just a cursory touch. That’s what’s so great about reading HIStalk…you learn more than just a few talking points. All I can say is thank you, Mr HIStalk for all you’ve done with this forum, and for agreeing to the interview. I’m fairly new to HIT, but feel I’ve been propelled forward possibly by years because of my daily reading here. I’d also like to say thank you for allowing me to rant once or twice, even though I maybe got a little personal about one or two of your contributors who happen to work in high places. I’d say you are not only even-handed and thoughtful about responses, you express yourself extremely well, and you have a lot of heart to allow a small-fry like me to speak out against some heavy-hitters on occasion. I’d like to offer up the notion that all the “responses/comments” you get are all just from you with creative ID names! It allows you to force the discussion and stir it up when necessary. I knew it!!! Sometimes, under these other fake IDs, Mr. HIStalk even writes with a total lack of sense or of humor to keep us off the track. Your secret’s out, Mr. H….Oliver Stone solves another grand conspiracy! Someone need to say what many of us are thinking. No one does it better than you. Keep up the great work. In the world of hype and superficiality that is otherwise known as healthcare IT you are a breath of fresh air! Thanks for all your hard work. My weekly frantic stressful convoluted informatics practice is always smoothed out by reading the discussions presented in HIStalk. I look forward to the criticism and controversy over some mundane element in the healthcare sector and deeply appreciate the insights into the problems and embarrassments of my colleagues; better them than me. Mr. H does a great job of presenting the mosaic landscape of Health Information Technology conundrum and look forward to each and every posting. Thank you for the early Monday morning posting of HIStalk on Saturday night – it is appreciated and read on Saturday night as an example of “meaningful use” of HIStalk adoption. BTW: Just a disturbing pattern in the moniker “HIStalk” that I see as “HI Stalk” for some inexplicable reason. Appreciate the interviews with folks in the HIT industry and Mr. HISTalk’s feedback on but there was a lot of fluff & self-promotion here. Don’t do it! Do not reveal your identities! We all need someone to believe in…and your hidden identities help to separate having your word tainted by the world at large…and by influencers who will come after you. No holds barred. It will lessen your impact…and there are so few things left to believe in! We all want to believe….close your eyes…and Inga, you can tap your heels together on any number of pairs of beautiful shoes….and repeat…..